British Airways is being investigated by UK and US regulators for the alleged price fixing of fuel surcharges on long-haul flights to and from the UK. 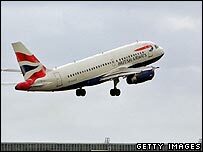 BA said it was co-operating with the UK Office of Fair Trading (OFT) and the US Department of Justice (DOJ). BA said that other airlines were also being examined, while Virgin Atlantic and American Airlines have said they are helping with the investigation. The OFT said it was too early to assume that competition law had been broken. "The OFT will not be in a position to conclude whether the law has in fact been infringed until it has completed its investigations and assessed the available evidence," it said. It said that it was conducting an investigation into British Airways under its civil powers, and into "certain individuals" as part of its criminal powers. Later in the day the US department of Justice said its antitrust division was "investigating the possibility of anticompetitive practices involving surcharges and rates for passenger fares and air cargo shipments". But it did not say which airlines were being investigated. BA said its policy was to conduct its business "in full compliance with all applicable competition laws". It said it had given its commercial director, Martin George, and head of communications, Iain Burns, leave of absence during the inquiry. The OFT visited BA's premises on 13 June as part of its investigation. The airline's passengers currently pay a £35 fuel surcharge on each long-haul flight, £70 for a return ticket. This compares with American Airlines, which charges £37 in fuel surcharges for a one-way ticket from the UK to the US. Peter Sherrard, Ryanair's head of communications, told the BBC that an investigation into fuel surcharges was long overdue. "We think it's high time that the fuel surcharges of British Airways and other flag carriers are investigated, and we certainly welcome the decision to investigate it by the OFT and the Department of Justice in the US. "British Airways' reaction to rising oil prices has always been to penalise passengers by increasing their fuel surcharges at an even faster rate, so, since May 2004 the price of oil has doubled from 35 to 70 dollars a barrel and British Airways has increased its fuel surcharge 14-fold." If found guilty of anti-competitive behaviour, BA could be fined up to 10% of its worldwide sales, which came in at £8.5bn for the year to 31 March. Its shares fell 5.5% in morning trading. In a statement, American Airlines said it had "received a United States federal grand jury subpoena in connection with a government investigation into alleged price fixing in the air passenger industry". But it had been told that it was not a target of the investigation. United Airlines, Continental Airways, Lufthansa, Finnair, Air France KLM, Icelandair, SAS, bmi and Ryanair have also said that they are not being investigated. Last February BA and a number of other airlines, including Lufthansa, Singapore Airlines and SAS, were investigated by the European Commission and US competition authorities. That inquiry was believed to focus on the area of fuel surcharges and other levies for cargo handling.